I believe that every one of my kidlets is an artist. I believe that they are creators - that their process is more important than the final product. I believe that we can all learn about art from the Masters. Sometimes we create in the style of some pretty well known artists. Last fall, when the sunflowers were tall and glorious, we painted sunflowers like Mr. Van Gogh. 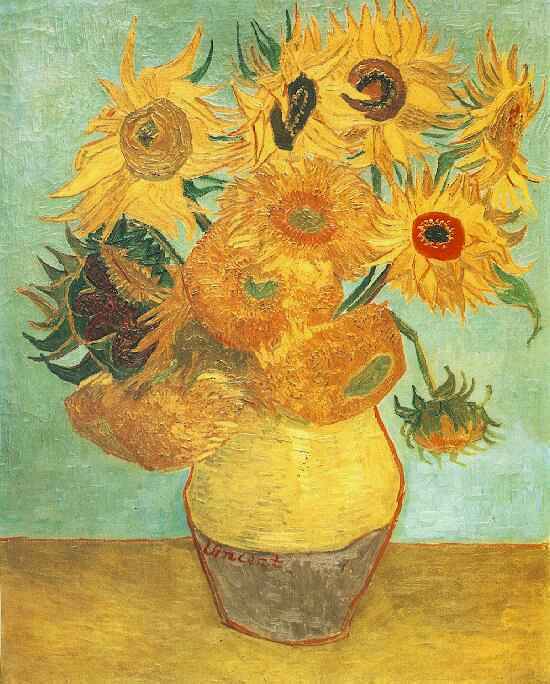 In honour of Throwback Thursday - Sunflowers: Mr Van Gogh Style. Last week I had my last-year's-kindergarten-class back for a week until new class lists were settled. Kids who are already friends with some artists - Mr. Van Gogh, Mr. Picasso, (met him twice) Mr. Kandinsky and Miss O'Keeffe. Kids who have already heard about Mr. Van Gogh painting sunflowers. Kids who create amazing art work. 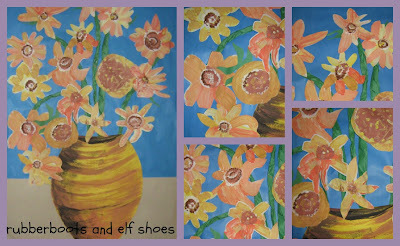 So, we painted our own class version of Mr. Van Gogh's Sunflowers. 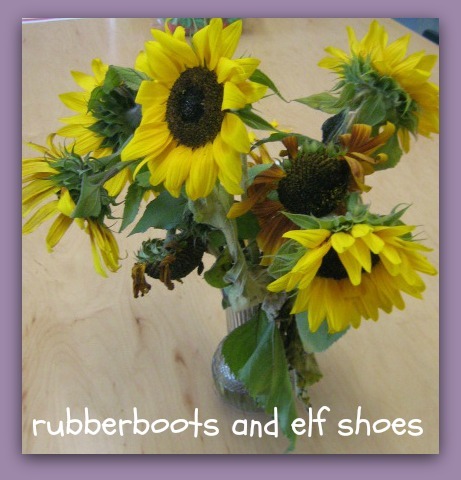 We looked at Mr. Van Gogh's painting of sunflowers as well as some real sunflowers. 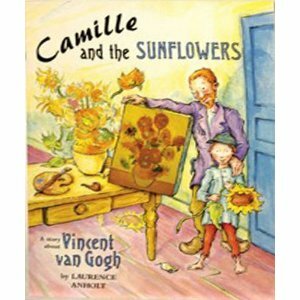 I was hoping to read the kidlets the book Camille and the Sunflowers by Laurence Arnholt but was not organized enough to order it from the library in time. But that all worked out, since it forced me to look online, where I found a fabulous ipad app - Van Gogh and the Sunflowers. Fun Educational Apps calls Van Gogh and the Sunflowers "a chef d'oeuvre that will engage, educate and entertain your kids to discover world famous painter Van Gogh." I concur; the graphics were beautiful and engaging (we viewed as a class through apple tv), the games were fun but did not distract from the essential message and tone of the story, and the kidlets had fun exploring further on the ipads. Painting time - each child was asked to paint one flower to add to the vase. There were trays of a couple shades of yellow, an orange-y colour and brown paint. No brushes, no fingers - small sponges and q-tips. And inspired they were. I was so delighted how each child really studied the flower that they chose to paint. They thoughtfully chose which colour paint to use and how to paint their flower. Our Mr. Van Gogh sunflowers are amazing. I love the individuality in each flower. (Two of the kidlets looked at our copy of Mr. Van Gogh's painting and decided to paint "round" flowers like he did - fabulous!) I love that the whole is so much more than the sum of its parts. I love the way that creating makes us look at our world. I just burst with pride when I stand back and let the marvel of my little kidlets sink in. Not because I have anything to do with it, but because i got to spend a year of growing with them. Now it is time for those little fledglings to leave my nest and move on to their grade one lives. And I will welcome my new little marvels with an open heart. I guess, sometimes, the "product" is too small a box for creativity.